This article is dedicated to Fred Goldhirsch (d. May 15, 2010), The Right Move’s founder & inspiration. It was shortly after the Nazi rampage of Kristallnacht that a young Fred Goldhirsch and his family fled Vienna, Austria, eventually settling in the U.S. By 1944, Fred was an American soldier in the Army Corps of Engineers, serving in Normandy and searching for the Nazis who had terrorized his family (he didn’t find them). In October 1990, Goldhirsch joined with fellow board member Norman Friedman to found the Right Move organization as a division of the Manhattan Chess Club. Former club president and national master Doug Bellizzi assisted in the process and remains active in the organization. Goldhirsch insisted that all programs be available at no charge, and this remains a cornerstone of Right Move to this day. As such, they have always run a tight ship, with all officers serving in an unpaid capacity. 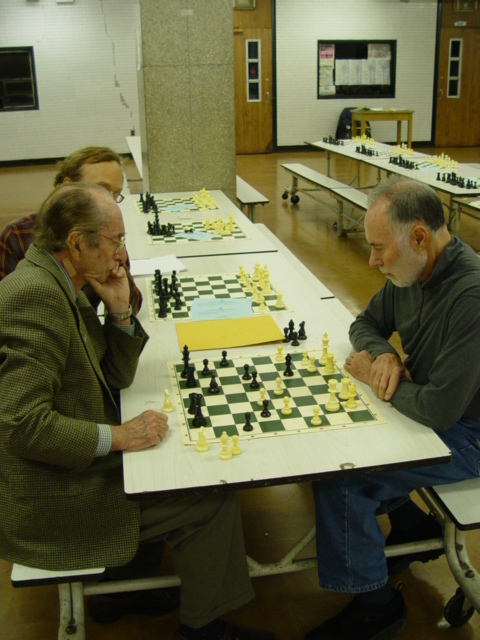 There is no overhead and no paid staff, although chess teachers and tournament directors are paid for their services, primarily through the generosity of Goldhirsch himself. While still continuing to provide chess classes through their network of teachers, Right Move began emphasizing their free tournaments for kids under age eighteen throughout the New York area. Since it costs $14,000 to place one teacher in one school for the school year, it has proven more cost-effective to concentrate their efforts in providing the Right Move series of free tournaments. Fundraising has always been difficult, with occasional donations coming in from various foundations and individuals. With help from Executive Director Eliot Weiss, Yoko Ono was one of the contributors at one time, but at present, virtually all of the funding for Right Move comes from Fred Goldhirsch. In 2002, Right Move became a separate foundation known as the Right Move Chess Foundation, Inc. Continuing to safeguard Right Move’s precious funds, Goldhirsch was able to obtain the accounting and legal work setting up the foundation at no cost. Currently, the free Right Move tournaments are offered at several locations throughout the New York area, including Manhattan, Brooklyn and the Bronx. Typically, two or three tournaments are scheduled each month during the school year. A look at the USCF MSA listing for Right Move shows twenty-five rated Right Move events during the 2006-2007 school year. USCF membership is required for these tournaments, but there are no entry fees, with Right Move picking up all costs, including USCF rating fees and any rental fees. Fred Goldhirsch is a big fan of the many benefits that chess has to offer, and a big fan of Right Move specifically. “I like the program a lot” is a phrase he repeats often. “Chess is a wonderful game,” he stresses. “It teaches kids to think more deeply and to be more careful in the actions they take.” He says that in chess, making a bad move has consequences, and the obvious hope is that kids make the connection that life works the same way. Goldhirsch said that sometimes, he’ll see a young child playing in his first chess tournament, and he compares it to a fish biting bait – he can really get hooked. It’s possible the player may receive a free USCF membership, paid for by Right Move. When the child sees his initial rating, and compares it to that of his friends, he may become motivated to make a real effort to improve. He’ll take the time to study books and practice, and gradually will come to the realization that hard work pays off. These are the kinds of lessons Goldhirsch wants to impart and what keeps him motivated to continue supporting Right Move. Despite charging no entry fees, Right Move offers a variety of prizes at their tournaments. Kids may walk away with free USCF memberships, trophies, monetary prizes, t-shirts, medals, hats, and bags – enough to brighten their day and to encourage them to continue to work at developing their talent. Realistically, Goldhirsch notes that many kids go through the Right Move events, and in most cases, it is not clear at all if chess is making a real difference in their lives. But he is quick to add that even if only a few kids benefit in a major way, that alone makes all the time and effort worthwhile.